Any question? Need extra information? Contact us and we will give you the answer. The OBLIK2 is designed for higher capacity and has three pairs of rollers and two pressure boards. The speed of the belt and rollers is controlled by a potentiometer. A depositing system can be positioned under the machine; the legs for the OBLIK2 are made on request. 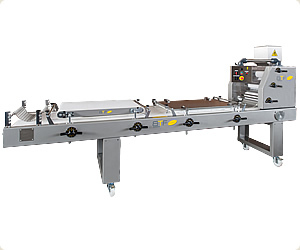 All the machine parts which come into contact with dough are made of materials permitted for the food industry. The roundly shaped dough pieces enter the centering hopper. The dough is rolled into the desired thickness between three pairs of rollers. Under the stainless steel chain drag the dough sheet is rolled into a loaf. The loaf is finally shaped on its way between the conveyor belt and the two moulding boards. The height of the moulding board can be precisely and accurately adjusted by two handles. The side guides are adjustable..
Options: Motorized pressure board, Knives in pressure board for dough cut, sidegudes adjustable with handwheels. Copyright © 2010 BTF Pekarski inženiring d.o.o.. All rights reserved pridržane.